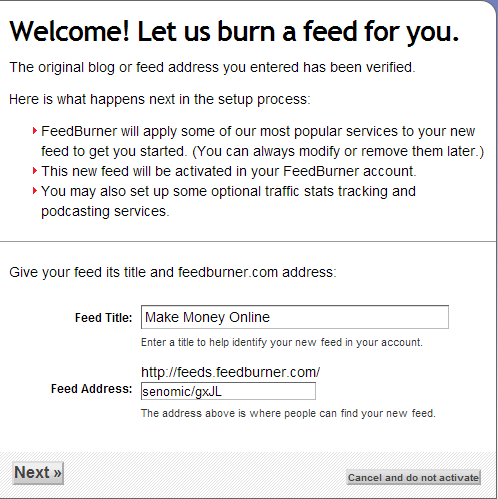 Email marketing is also called outbound marketing, but in this article I will provide you step by step guide to add Feedburner to your blogger blog, before going to tell you how would you do it, let me tell you, it's benefit, feedburner is free, which service now providing by Google, when you will create a blog post your subscribers will get notify automatically to their mail box, then if you are little smart you are getting me, you will get those subscribers as your blog readers probably for forever. 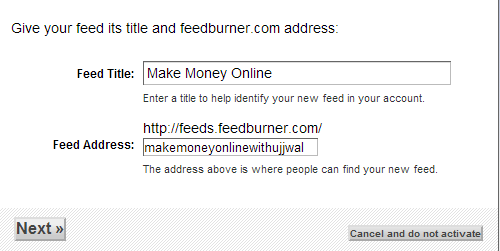 #1) Go to www.feedburner.google.com, now enter your gmail account user name and password, then you webpage will redirect to the new page, as I have given below screen shot. #3) After click on RSS feed, then the box for RSS feed will be green as you can see on the above, now click on "Next", then you will see new page, as I have given below the screen shot. 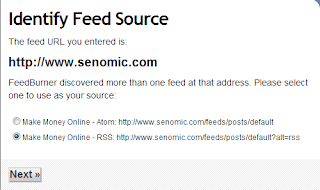 #4) Now where you are seeing senomic/gxJL, that is your feed burner address, you are seeing definitely different address for every one, because every one having different address like user name in Google, make sense. 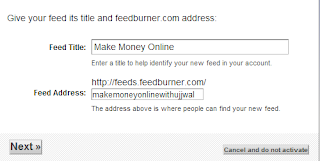 Now to make effective your blog feedburner URL add there Your blog header namse, just like for me Make Money Online, but if your blog header is not available then you may add after header name your blog name. 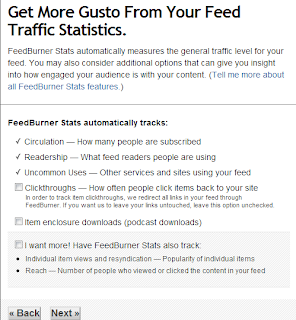 #7) Click on all three box to use Feedburner effectively, lets start clicking, click on the of "Clickthroughs", then click on the box of "Item enclosure downloads, last one click on the box of "I want more! 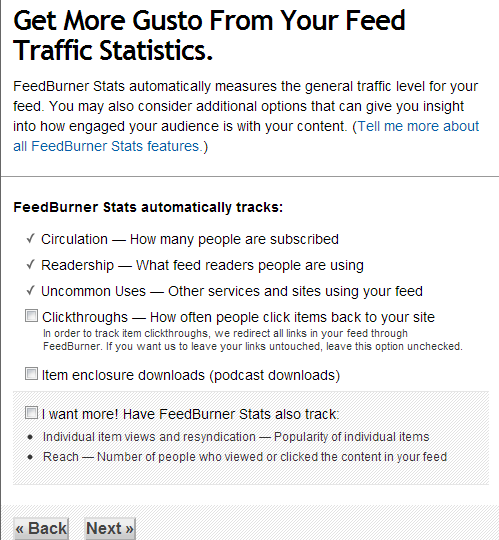 Have feedburner stats also track", then click on "Next". 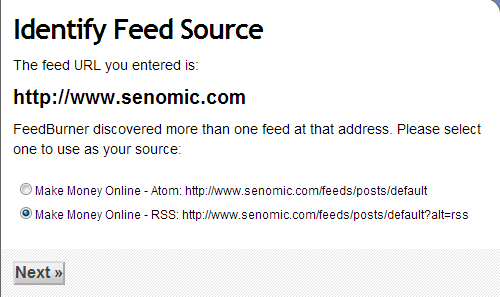 #9) Now add Feed Burner Code to Your Blog and get subscribers for free to your blog for your new blog post. Just change the name with your own name, then add to your blog(if you know how to add HTML/Java Script to blogger, then you can add this code). Hopefully this tutorial help you properly! 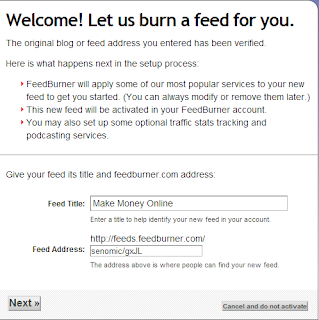 In my next blog post, I will tell you, how to add Feedburner code to your blogger or blogspot blog to get blog subscribers.